History of 5-2-1-0 Let's Go! 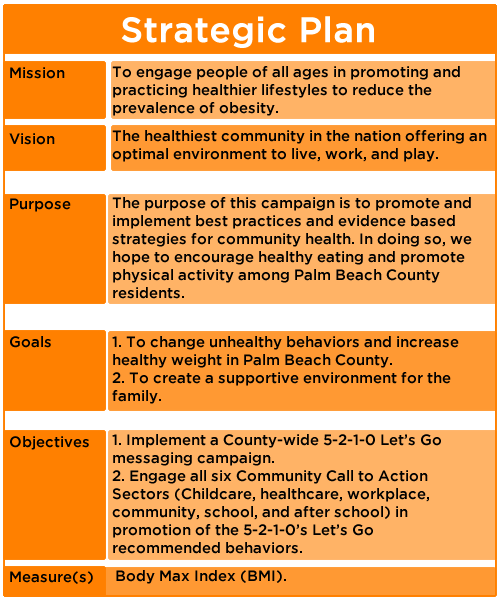 In 2012, The Community Call to Action on Obesity Coalition was formed in response to the growing obesity epidemic in Palm Beach County. Our coalition was comprised of over 50 community stakeholders, representing over 30 sectors throughout the community and varied community experts such as parents, teachers, students, seniors, community leaders, elected officials, and diverse workforce professionals. Collectively, we worked to promote and achieve a healthy weight status among Palm Beach County residents. Based on the Social Ecological Model, the coalition successfully implemented five of seven action strategies across Palm Beach County influencing individual, interpersonal, organizational, community and social environmental factors. 1. 5-2-1-0 Let's Go! : Promoted 5-2-1-0 across all Florida Department of Health WIC sites, worked with 25 child care provider to promote 5-2-1-0 and implemented a community wide 5-2-1-0 summer initiative. 2. CDC Diabetes Prevention Program: Increased the # of trained national Diabetes Prevention Lifestyle coaches from 2 to 12, implemented 2 successful NDPP programs, and increased the # of private insurance and HMOs willing to refer and use NDPP. 3. Commit to Change: Recognized 3 local governments for implementing healthy eating and/or physical activity initiatives. 4. Farm Fresh Corner Stores: Nothing was implemented, correct? 5. Community Gardens: Established # community gardens in # municipalities. 6. Fitness Zones: Installed 1 fitness zone in Lake Worth. 7. Joint-Use Agreements: Established a joint use agreement with Lake Worth middle school and Berkshire elementary school that was approved by the Palm Beach County school district.